Catch up on the the latest developments and other ramblings. Short stories, poems, and other writings. Many related to the World of Enelis fantasy fiction. [Links to Author site]. Check out my latest recordings and other attempts at being musical. Wow... just updated to GIMP 2.10. So easy on the eyes. Experimenting with some eye animations for portraits. The studio is back! We're working on a new game. Will post updates soon. More updating of the engine this week to deal with all activity in active world locations. The day-job has been eating into my Fief-time lately. However, the shift to world-map exploration continues. Some work on combat UI's this week. Have a research conference in Copenhagen this week too; 9-hour flights tend to aid development. 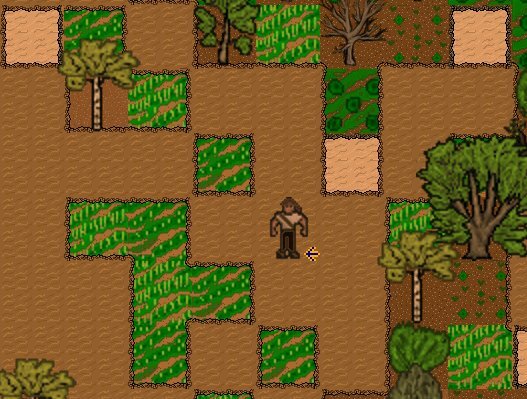 Still working on world map exploration and fleshing out new combat UI's. This week the mapping system is getting an overhaul in preparation for world map exploration. Action Mode is nearly complete. The camera follows nearby creatures during their action phase, making combat very turn-based and tactical. Overhauled the event system today. Now there is are two time modes, Action (for tactical combat) and Peaceful (for just enjoying the world). Added support for tile transitions on the main screen, these will be optional to help those with low-end machines.